Love from the Kitchen: Tuesday's Table for December 10, 2013 - And a *Giveaway*!! Tuesday's Table for December 10, 2013 - And a *Giveaway*!! Thanks to everyone who linked up last week. For this week, I chose Cooking with K's Gingerbread Oreo Truffles as my feature. They look incredibly decadent. 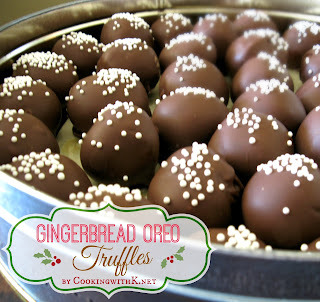 I've been considering making truffles for my office this year, and this recipe may just be where I start. You need to head over and see her site.! #39- Ragdoll Kitchen!</drumroll> Please send me your mailing address and I'll get that out to you right away. Thanks for the party! I agree those truffles are FABULOUS looking. I'll have to try them. Thanks for bringing your Spritz Cookies! And I love your idea for getting the sprinkles to stay on. Mine never stay on either - I will definitely have to try this! How do I contact you? I don't know if I even qualify for a prize. I live in Canada. This is my first time here—even prizes! Thank you for hosting.